Dreamy desert islands are not worlds away this winter. This month’s selection of exotic escapes brings you the best of beachfront wellness and relaxation with just a pinch of revelry. Revitalise your mind, body and soul with a tailor-made wellness journey that focuses on the three main aspects of health: diet, exercise and sleep. Bend your body back into shape with daily yoga routines and savour the chef’s curated healthy meals at breakfast, lunch and dinner. The island’s exceptional team of spa therapists and culinary masters will guide each guest along their own transformational path to ultimate wellness. The “Health & Wellness Retreat” package includes up to five nights’ accommodation in a villa, speedboat transfers, complimentary upgrades, all meals at all-day dining venue The Edge, daily yoga and a range of massages, meditations and other treatments. 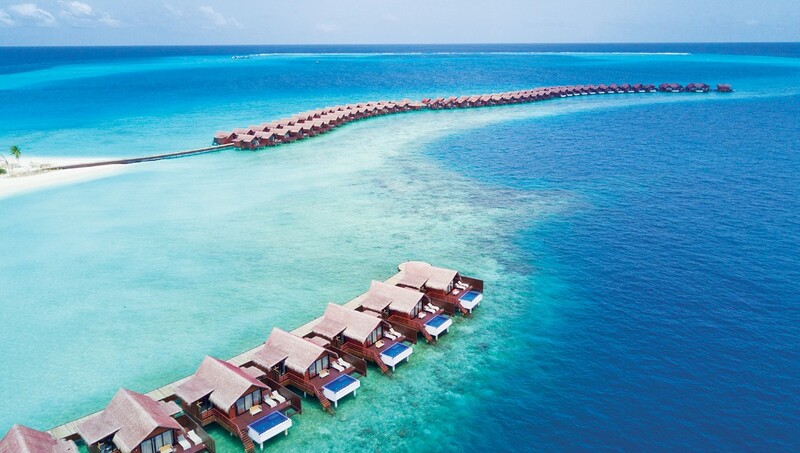 The Maldives is a world of boundless relaxation and exquisite dining, augmented with the “Essence of Maldives” package at the beloved Baros resort. Guests can sip Champagne in the luxury of their Deluxe Villa, enjoy gourmet cuisine under a starlit sky, and witness breathtaking beauty on a stunning sunset cruise. You’ll experience the very best of Baros with a daily breakfast, return airport transfers, a sunset cruise, marine biology presentation, nature walks, Champagne on arrival and 15% discount on spa therapies. Abandon your cares in the blissful surrounds of Sainte Anne National Marine Park, with a five-star stay that ensures magical moments to remember. JA Enchanted Island Resort invites guests to lounge in their own pool or explore the islands by boat before returning to world-class cuisine and captivating Creole architecture. Just off the coast of Mahé, the colonial-style JA Resorts & Hotels property features only 10 Creole villas, with French bathtubs, private pools and direct beach access. Snorkel, swim and kayak in the crystal clear Indian Ocean and soak up the sublime atmosphere of the Seychelles with the “Seychelles Romance Break” offer. Loved up couples can benefit from up to 30% discount on the Best Available Breakfast Rates with a raft of complimentary inclusions, such as a welcome drink, dinner experience, 60-minute massage for two, a bottle of bubbles on arrival and much more. Not many people would consider encountering Bali for a mere 48 hours, so this three-night “Villa Indulgence” package is the perfect treat to slip into your Indonesian adventure. The Seminyak Beach Resort & Spa is ideal for couples seeking privacy, with spacious villas spread across a glorious island resort, allowing guests to unwind in style at Santan restaurant, one of the finest restaurants in the idyllic getaway. When you stay three nights in a Garden Pool Villa or Ocean View Pool Villa, you’ll be able to indulge in a daily breakfast and afternoon tea in the privacy of your abode, complimentary airport transfers, a 90-minute treatment at Kahyangan Spa, early check-in and late check-out and much more. Why not jet away to Anantara Kalutara Resort for an unforgettable romantic escape? Set in a secluded setting where the Kalu River meets the Indian Ocean, on the picturesque south west coast, the resort’s “Romance Package” will satiate all your senses with lavish breakfasts, gourmet dinner spreads and muscle-melting massages at the hands of the expert therapists at Anantara Spa. Spend the day walking through the Lunuganga Estate, the country home of the renowned Sri Lankan architect Geoffrey Bawa who’s vision created the beautiful spaces of the resort. End the day with a romantic candlelit bubble bath to set the mood. Bring your sense of wanderlust to this secluded beachfront paradise, explore lush havens, and work up an appetite for the host of inspired dining options, such as Olu, where couples can enjoy all day dining. Adventurous gourmands can also opt for the Anantara’s Dining by Design concept, which gives the opportunity to create a completely bespoke, romantic dinner to remember. How about a sunset barbecue with a fresh catch delivered by local fishermen, grilled and served on the beach by your chef and butler? Plenty of Seychellois resorts have their own private beaches, but how about seven? The entirely private coastal enclaves encircle Frégate Island, home to just 16 ultra-luxurious villas. The exclusive escape ensures utmost discretion with ‘Beach Occupied’ signs to ensure yours may be the sole footprints in the sand. Want to take it one step further? Guests can opt for exclusive island rental for a truly magical stay. Put together your very own exclusive guest list and share the island’s beauty and delights with those closest to you, with a team of live-in staff to ensure that every conceivable desire is fulfilled to perfection. With a scenic location, outstanding amenities and award-winning service, Courtyard by Marriott Bali Seminyak Resort is sure to make your visit extraordinary. The hotel is just a few moments away from the famous restaurants and bars of Eat Street, as well as beautiful beaches including Potato Head Beach. Stretch out in your gracefully appointed room or suite, which features pillowtop bedding, free Wi-Fi access, a rainforest shower and a private balcony or terrace with views of either the resort or of Bali itself. Delectable dining options include international fare at Seminyak Kitchen, a stylish steakhouse, the pool bar and a one-of-a-kind Mexican food truck. Whether you break a sweat in the fitness centre, or relax by one of three sparkling pools, make sure to enjoy an indulgent treatment at the hotel spa – Zanti The Retreat. Your dream escape is awaiting you at Courtyard Bali Seminyak Resort. Who can say no to a trip to London, a city steeped in history, with culture and retail gems on every corner and stunning architecture evident with every glance? Every weary traveller needs a place to rest their head and you would be far pushed to find a more plush setting than Taj 51 Buckingham Gate Suites and Residences. In keeping with the Taj ethos of providing exceptional service, the hotel goes above and beyond to make your stay special and unique at every opportunity. Boasting some wonderful dining outlets, including the Michelin-starred Quilon, offering the very best in southwestern coastal Indian cuisine, foodies will be in their element. The hotel is laid out in a way that offers utmost privacy – a luxury in itself – with spacious rooms and suites designed with a fusion of traditional British style and Indian heritage. If a few days at the hotel are not enough, there’s a chance to stay for four nights and pay for three in the hotel’s two- and three-bedroom suites, allowing extra time to explore the iconic sights surrounding the hotel, such as Buckingham Palace.